ARCHS' Culinary Arts Program graduated 12 female ex-offenders on July 23, after they completed an eight-week class at St. Louis Community College - Forest Park. Participants in the program are currently under state or federal supervision with probation and parole officers in St. Louis City or County. 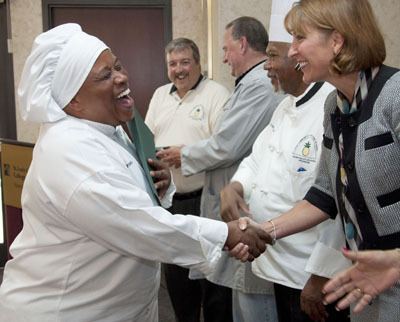 They received academic culinary training leading to "ServSafe" certification. They will also receive job training from St. Louis Community College and job placement, wrap around social services support, and life skills preparation from Employment Connection. ARCHS' program will allow female participants access to traditionally male career paths such as chef, head cook, line cook, institutional cook, and more in the culinary field. According to a National Institute of Corrections Report, the number of incarcerated women has skyrocketed, at rates exceeding men. "This unique partnership is a crucial component to decreasing recidivism dates for these participants," said Les Johnson, ARCHS' Vice President of Family and Community Programs. "They will have access to training by a nationally accredited and recognized culinary arts school, which will assist them with a second chance." ARCHS partners with Lutheran Foundation of St. Louis, Employment Connection, and St. Louis Community College to provide this program to female ex-offenders. ARCHS provides strategic support to STAR. An ex-offender who graduated from ARCHS' 2008 prisoner reentry program in automotive technology was given a fully refurbished vehicle from Ranken Technical College as part of the Recycled Rides Program. Antonio Bobo, along with his wife and five children, were presented with a 2006 Ford Taurus on December 4 from Ranken Vice President of Student Success John Wood. Antonio participated in ARCHS' reentry program funded by the U.S. Department of Labor (2007-2008) that served 650 federal and state ex-offenders served (exceeding goal of 480). ARCHS' program secured 350 job placements (such as Bobo's) with a combined annual payroll valued at more than $5.6 million. With the assistance of ARCHS, Bobo graduated from Ranken in 2008 with a certificate in automotive light maintenance training. Today, Bobo is an assistant manager at the Jiffy Lube in University City. This program is not currently funded, and no cars or reentry training programs through ARCHS and Ranken are available at this time. 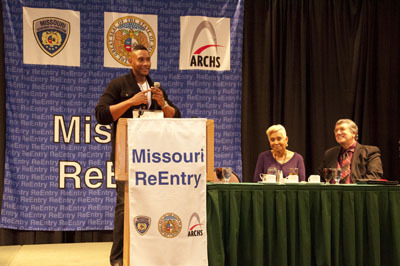 The 2012 Missouri Reentry Conference was held November 14-16 at Tan-Tar-A Resort at the Lake of the Ozarks. The 7th annual conference featured keynote speeches from Robbie Montgomery and Tim Norman of "Welcome to Sweetie Pie's" TV show fame. The conference also included remarks from ARCHS' Chief Executive Officer Wendell E. Kimbrough, Missouri Department of Corrections Director George Lombardi, and FACT Executive Director William Dent. In addition, a speech from President of National Association of Blacks in Criminal Justice Carlyle Holder was given, as well as a various breakout sessions, and a Faces of Reentry panel discussion. The conference was sponsored by ARCHS, Missouri Department of Corrections, Missouri Department of Social Services, and Family and Community Trust (FACT).